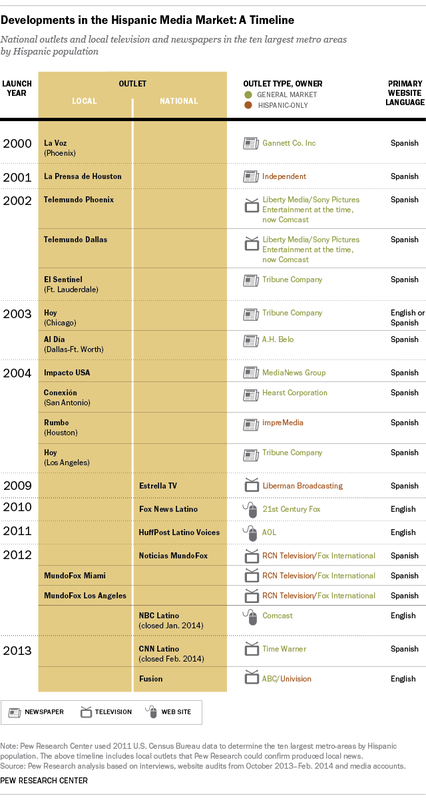 Shown below is a list of media outlets geared toward the U.S. Hispanic population that have launched since 2000. The 20 outlets include seven that are national and 13 that serve the 10 largest metro-areas by Hispanic population, according to the U.S. Census. What’s clear from the timeline is that general market companies, those that also own outlets geared to the overall U.S. population have jumped into the Hispanic news industry in recent years. Six of the seven national outlets listed were started by these general market companies, including a handful that are partnerships: Fusion is a partnership between ABC News and a company focused solely on Hispanic media (Univision) and MundoFox is a partnership between Fox International Channels (owned by 21st Century Fox) and RCN Televisión, a Colombian broadcast television company. Not all of them have been successes, however. NBC Latino—a website-only outlet—closed in January 2014, after only 16 months. CNN Latino, which had on-air programming, was shut down in February 2014, just a year after its launch. Univision, launched in 1962, remains the largest national Hispanic-owned media company in the U.S.
General market companies have also moved aggressively into the local media markets: 11 of the 13 local outlets launched since 2000, were started in part by these companies.